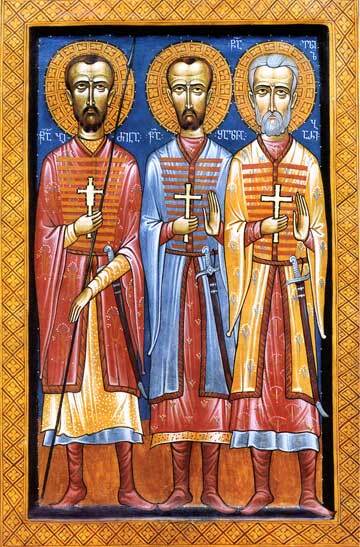 The Martyrs Bidjen (Cholokashvili), Shalva and Elizbar of Xana – were Gruzian princes who liberated Kakhetia (Eastern Gruzia/Georgia) from the Persians. At the demand of shah Abbas II all three were handed over to him, with the connivance of the Gruzian emperor Vakhtang V (1658-1675), who had accepted Islam and became known under the name Shah-Navaza. When they brought the holy captives before the shah, then at the typical interrogation they answered, that they were Christians. No one was able to force the conviction of the martyrs to change, standing firm as they did in their confession of faith in Christ. Shah Abbas, trying every which way, including promises, threats and tortures, sent Bidjen, Elizbar and Shalva to the former ruler of Kakhetia, the sultan of Aldaran, who lived then at Ispagana. The sultan, seeing their steadfastness, gave orders that after fierce tortures the heads of Elizbar and Shalva be cut off, and that this be done before the eyes of Bidjen. Bidjen he ordered as a sign of shame to be dressed in prostitute's attire and led through the city on a donkey. When even after this Bidjen wavered not in the faith, they subjected him to new lacerations and torments: his body was broken at the joints, and finally, his venerable head was cut off. This event happened on 18 September 1660 (by other accounts, the martyrs suffered under shah Sefi, son of Abbas II, in the year 1664). The bodies of the holy martyrs were thrown out in burial pits outside the city. By night a light shone over them, streaming down from the heavens. Seeing this, local Armenians removed and secreted the holy relics in their church. After a certain while the relics were transferred to Kartalin and with reverence buried in the Ikhort monastery near the city of Hora.